That may be what our dog Sue would like to sing after Monica put up a partial fence in the yard in Mobile. 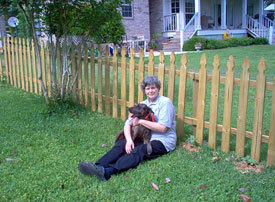 Sue wears an electronic collar that keeps her in our yard, and she does not leave the yard unless one of us takes her out for a walk on the dirt road that leads to our house in a remote part of the city of Mobile. However, she does like to test the limit by barking at the dogs or the activity in the next yard, which is where Monica’s cousin lives. So Monica put up a partial fence along the property line. She dug the holes for the posts and used Quickcrete to anchor them. The fence sections were easy enough to mount on the posts. The fence is about 100 feet long. It does not enclose the yard and is actually "open" at the end. But it is enough that Sue is no longer distracted by what is going on in the next yard. Maybe "out of sight, out of mind" – or something like that, since Sue doesn’t really have a mind.